Just had a sale where I made 13$ which is weird since my clip price is $70. It appears that pond5 has introduced a web tier pricing to help us lose even more money. I'm currently going through and manually changing the cost of web pricing to match my HD prices. Thanks David. I hope everyone else raises up their web prices as well. What are your usual prices for each size? This is actually a good news. We'll make more money from web resolution sales than Shutterstock. Pond5 should've done this years ago. You can change the price in batch in setting. Account>Preferences.. most bottom column. by default web priced at 50% of your HD price. I'm not sure how this will play out for everyone, and I don't have enough "good" video to have it matter. But, if someone wasn't buying any video, because full size at full price was too expensive, then having the same person buy web size because that's all they need, should be an improvement? As for people setting the web size at the same price as 4K, don't expect any change in sales and maybe less. Forcing a buyer to take full size at full price, when they are only using the video for streaming, is like forcing someone to buy a 1 gallon jar of olives and they only need a few ounces to top a pizza. Sure stand up for your quality and investment, but realize full price for low res websize, you aren't going to get anything new, no gains, nothing. Someone else will get your money. Fair enough that's your choice. But this at least is a choice, and good of P5 to make the setting of prices easy for anyone who is going to virtually opt out of websize sales. I don't see the problem of paying less than HD prices for a web resolution? As long as the price is in relation to its size? I never understood the 'all sizes one price' thing on other agencies. Solid move. I'm all for it! Simple math. Pond5 wants to make more money. If Pond5 makes more money, total payout to contributors increase accordingly, not decrease. That's why they tested to see web size sales would have negative/positive effect to total sales. And we can set our own price on Pond5, it doesn't undercut competition. Disagree. I have clips that have sold for $500 USD and I've put a lot of work into making them. To say that they are only worth $24 is crazy. I don't care what resolution you watch my clip at, the clip is worth that much because of the quality of work I produce. People have been watching videos on their phones for years now, the resolution shouldn't dictate the price. I'd be happy to see a one price fits all approach and sell clips for the 4k price. If your work is truly amazing then you control the price, not the other way around. i support agency that pay us 50% and let us choose prices. Resolution shouldn't dictate the price, but that's how it is nowadays on most websites, even worse with the ones offering subscriptions. 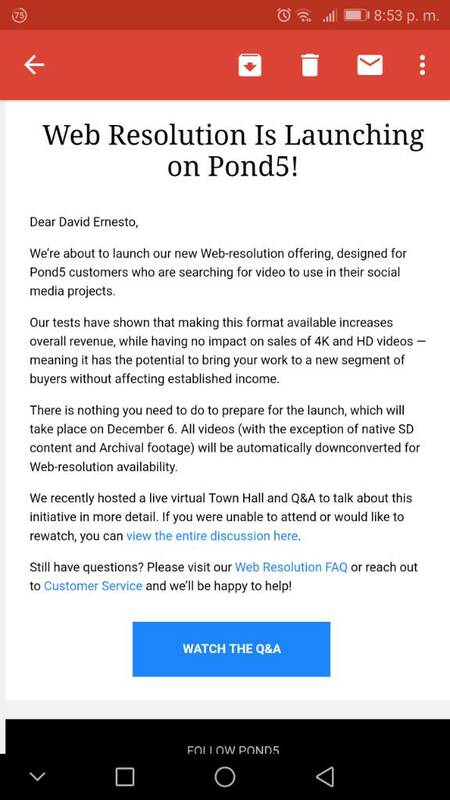 By offering Web at a lower price, Pond5 is trying to attract customers who are already purchasing for peanuts on other websites - not convert their own customers to buying the same for less. You don't have to sell web for $24, you can change the price manually. You can even set 4K, HD and Web at the same price if you don't feel that it is right, and if you've got unique content that nobody else offers on any other websites. I would like to see them put some marketing into selling stills. Thanks for mentioning that! It's not an easily apparent feature, to access it you have to click the bottom box for "Customize down-converted price percentages." It's a quick way to adjust the percentage difference between the 4K/HD/web prices. I compressed the price spread between 4K/HD/web. I think the default was something like 100%-50%-20%. I changed it to 100%-53%-33%. Then I went to my uploads and raised the price on all my 4K clips, so that the 4K and web versions are now more expensive but the HD price is where is was before. I would also but I've given up. Reviews took ages, and nothing happened, I think I removed everything and just gave up. Thanks and yes I looked, I have no photos, just video. Fine with me, I'm happy with the places I work with. I don't need to do more work for no return, or low returns. Imagine this... you own a site, you sell video and make most of your money from selling video, "Over 1,000,000 clips in 4K". Maybe the largest small agency stock video collection, in the world. Would you care much about photos, vectors, sound or anything else? Brings up another question, has anyone here ever sold a sound effect or music file on Pond5? The3dStudio new "Exclusive Pricing Program"
Lets help Race Photo design "Crapstock.com"
Bad Behavior has blocked 58153 access attempts in the last 7 days.